Presenting a collection inspired by the psychedelic, of when acid hit the scene in Britain, Sir Paul Smith's Spring '09 show was a cascade of beautifully subdued colour. Evoking a clear feel of summer, with both the its use colour and relaxed fits, the collection was certainly one of my favourite London shows. 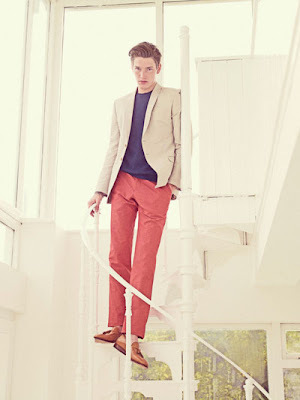 As such when I recently came across the Spring/Summer lookbook for Paul Smith, I was pleasantly surprised by what I saw. Toning down the acidhead edge from the collection, and taking on a decidely retro feel, the lookbook manages, for me, to beautifully capture the very essence of a care free summer. 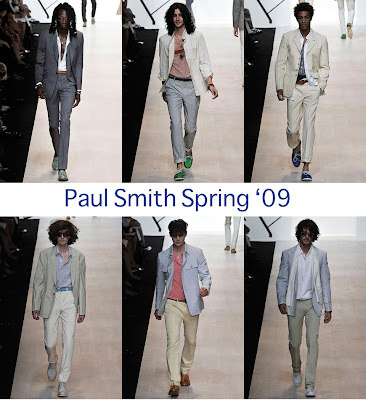 Paul Smith is so so underrated. i prefer the lookbook pictures, what is so appealing of drawing bruise like makeup on the runway models. I want to jump into the lookbook. I feel like there would be strawberries and cream and male models awaiting me there. It just looks so...relaxed summer with a really nice car. It shows just how wearable it all is, since it works both ways. I do love Paul Smith. I wish I were a man sometimes, just so I could wear it. Haha. But then I decide I like dresses too much. ONE PIECE OF CLOTHING!!! omg I just wish that I could find a guy who freakin dresses like this where I live its all about either baggy pants on one end of the spectrum or straight all out frat boy with the khaki shorts and a backwards hat at the other end where are the guys who dress like this?! But, I absolutely love the colors used! Very Spring/Summer and youthful. Hey Dapper Kid. Wow! I really love the pictures. The clothes look fantastic. I could definitely see wearing a lot of this. Thanks for sharing this with us. P.S. I'm adding your blog to the blogroll of my Dino Lounge blog. I would love it if you would add my blog to yours. Thanks. I am in love with the lookbook. I am absolutely adoring this lookbook! 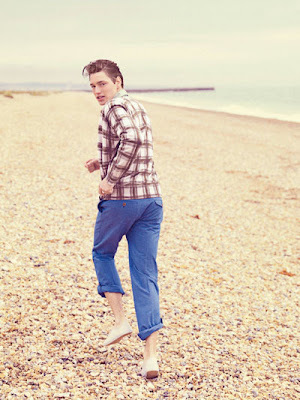 I'm a huge fan of when guys wear colored trousers and shorts - I think it looks fantastic :) And the setting for the photographs reminds me of the Cape (minus the palm trees), which makes me ache for summer! Loving the Lookbook! The salmons and yellows are so alluring! These looks are just so, well, dapper! There's something about the lookbook that just makes me think of Johnny Depp. Beautiful lookbook pictures! Everything looks as though it's been gilded by sunlight--so summery. definitely some vibrant colors this season. Very quirky orange/red..but don't know if I'd go out and buy that color yet. Thanks so much for the comment. Well, I have to have some conflicts going on ..with these personalities. A part of Rachel is a bit like my grandmother. She doesn't mind speaking her mind..but she'd be the first to say.."I never said that..."
Great photo's! And the outfits are amazing too! Wish my friend dressed like that.. 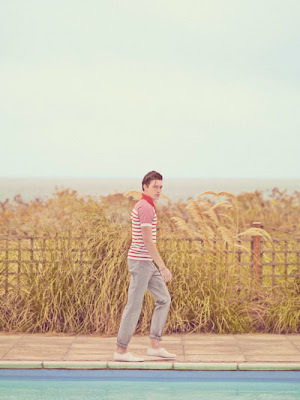 I still can't talk him into clothes like this haha :P I almost gave up..
oooooooh the lookbook is absolutely stunning. Wow I love the preppy + summery feel of this collection. Its so light colored it makes me wish spring would come TODAY. Love love love well dressed men! The lookbook looks amazing. I love the muted tone of the images and the bright pop of colour in the clothes. Something very nostalgic about the way these were shot. lovely. so clean cut, but with the perfect touch of style. and i love "candy girl" by new edition! This definitley captures the essence of summer! The colors are gorgeous. Great photos, so pure fashion! 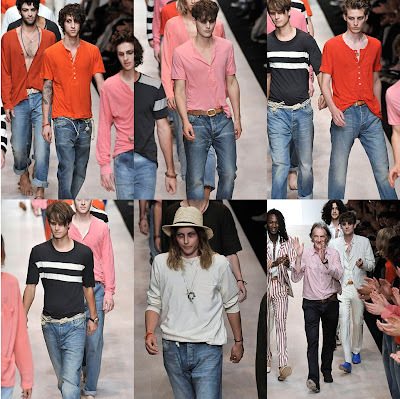 I love, love paul smith. I like the whole color scheme and relaxed fit of everything. its so perfect for summer. I'm liking the lookbook and the sunwarmed slightly bleach look to all of it.